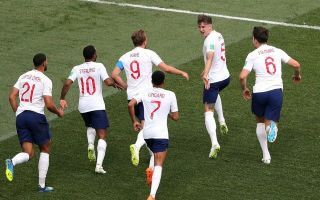 England secured a comfortable 6-1 win over Panama on Sunday, with Harry Kane, John Stones and Jesse Lingard amongst the goals. Gareth Southgate will be delighted with the performance from his players, as they found an early breakthrough against a stubborn and physical Panama side to give themselves an opportunity to settle into the game and score plenty of goals. Tottenham forward Harry Kane took home the match ball and our Man of the Match award after his hat-trick as he also led the England line well throughout in a real battle with the Panama backline, and he now has five goals in the tournament to lead the goalscoring charts. However, credit must also go to Jesse Lingard who put his wasteful performance against Tunisia behind him to secure a great third goal for England from distance, as he continues to pick up great positions in dangerous areas and looks a real threat for the Three Lions. John Stones bagged a double and gets an 8/10 after putting in a solid defensive shift too, while Kieran Trippier put in a tireless performance down the right flank as he looked defensively assured and an attacking threat. Ruben Loftus-Cheek came in for Dele Alli and slotted in well to show no inexperience at this level which will have also delighted Chelsea fans, while Liverpool captain Jordan Henderson put in another solid display in the heart of the line-up. England will be disappointed to have conceded a poor goal from their perspective, but the positives certainly outweigh the negatives as Southgate was also able to rest key individuals and give others an opportunity to impress. Fabian Delph and Jamie Vardy did well off the bench, and so it was another positive outing for England as they secured their place in the last-16 and will now face Belgium in their final group game hoping to top the standings. England player ratings: Pickford 7; Walker 7, Stones 8, Maguire 7; Trippier 8, Loftus-Cheek 7, Henderson 8, Lingard 8, Young 7; Sterling 7, Kane 9. Substitutes: Delph 7, Vardy 7, Rose 6.